Click to enlarge. 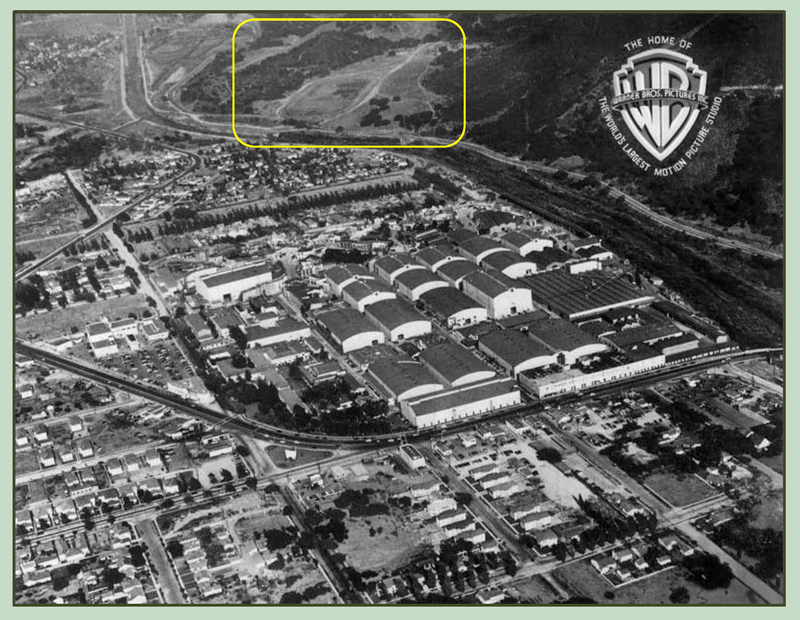 Looking east from Warner Bros. towards the Lasky Ranch. LAPL. The former Lasky Ranch, bordering Griffith Park near Burbank, and future site of the Forest Lawn Hollywood Hills Memorial Park which opened in 1952, is steeped in movie history. Once part of the Spanish-era Rancho Providencia, the Lasky Ranch was used for more than three decades as a filming location for scores of Hollywood productions. As documented in my book Silent Visions, Harold Lloyd filmed his “rural” comedy The Kid Brother there in 1926, while Rudolph Valentino filmed exteriors for both Four Horsemen of the Apocalypse (1921) and Blood and Sand (1922) at the ranch (see below). 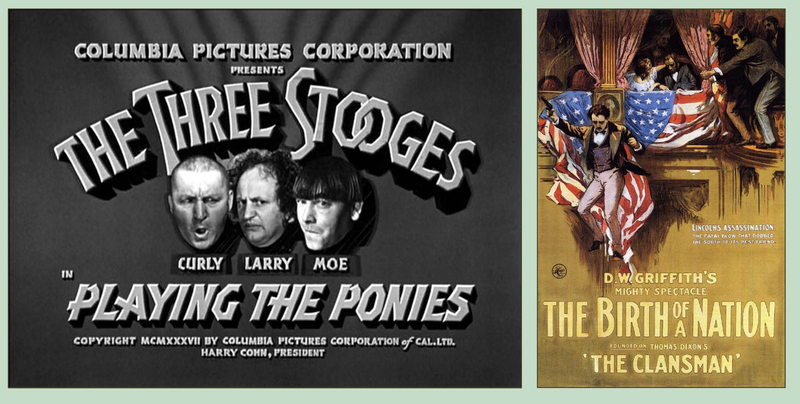 As shown here, the ranch also appears in an unlikely pair of films, D.W. Griffith’s monumental yet incredibly racist Civil War epic The Birth of A Nation (1915), and the Three Stooges comedy short Playing The Ponies (1937). Several massive ancient oak trees that witnessed both productions are still standing today. Looking east at the battle field from The Birth of A Nation. Trees N1 and 3 above are still standing. John Hillman SilentCinema.com. It is well-documented that Griffith staged the Civil War battlefield sequences from The Birth of A Nation at the Lasky Ranch. 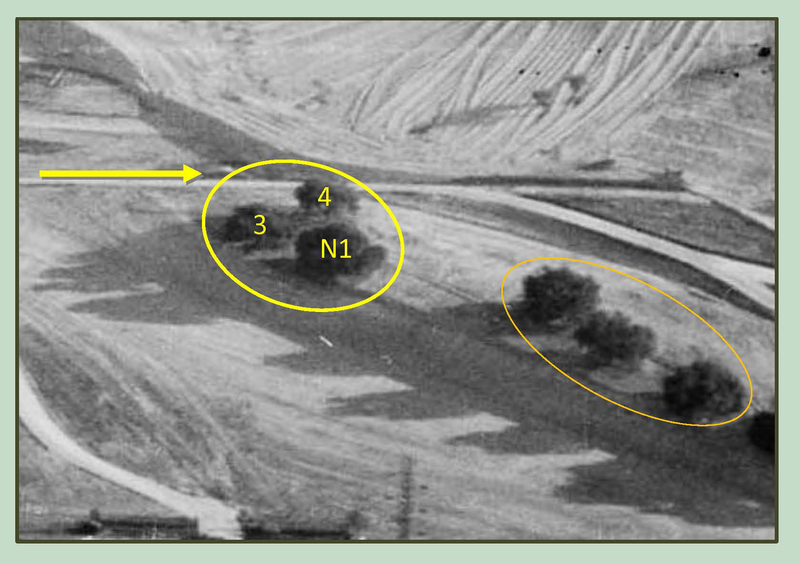 Above, by stitching together a production still from the movie, and test footage of the battlefield, both looking east, a prominent group of trees (the BOAN group) appears to the south (right) side of the field, consisting of a near tree (N1), a far tree immediately behind it (F2), a small tree standing where the two images overlap (S), and tree 3 and tree 4. Also visible are two hills, H1 and H2, and a path running between them. Click to enlarge. Notice the BOAN group of trees (yellow oval), and the distinctive trio of trees (orange oval) . Marc Wanamaker – Bison Archives. This circa 1922 view above looks east, showing the field of view (yellow lines) of the BOAN battlefield images above, and the dirt path between hills H1 and H2. The blue line marks the Los Angeles River. Beyond the hills lies a clever bullring set from Rudolph Valentino’s Blood and Sand (see below). The bullring set from Blood and Sand. Only a 1/16th slice was needed to capture the shots. 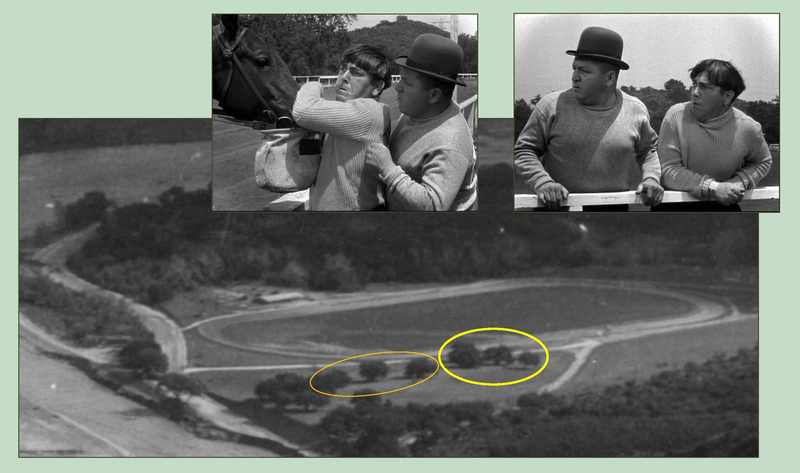 The aerial image below, looking south at the Lasky Ranch, references the Three Stooges in Playing The Ponies. Click to enlarge. Looking south at the Lasky Ranch. The yellow oval marks the BOAN tree group; the orange oval marks the nearby trio. Marc Wanamaker – Bison Archives. 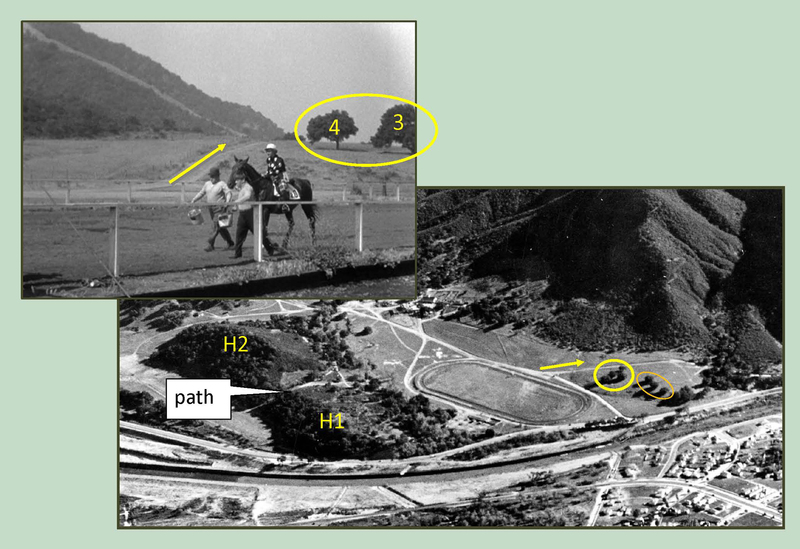 The aerial view above looks south towards the Lasky Ranch horse race track and the same path and hills H1 and H2 discussed above. The inset image of Curly, Larry, and Moe reveals trees 4 and 3, part of the BOAN tree group (yellow oval). Looking west, as Curly’s stunt double runs past the BOAN tree group (yellow) and the trio (orange). Looking east at the rack track, and the BOAN tree group (yellow) and trio (orange). USC Digital Library. Below, more views looking west at trees 4 and 3, part of the BOAN tree group. Two views west towards trees 4 and 3, part of the BOAN tree group. If you’re not overloaded yet, the following steps in my analysis are even more technical, so hold on, or you can just take my word and skip to the end. 🙂 To begin, let’s take another look at the BOAN tree group (below). This image from Playing The Ponies provides a rare view west at the BOAN tree group. We’ll return to this image later. 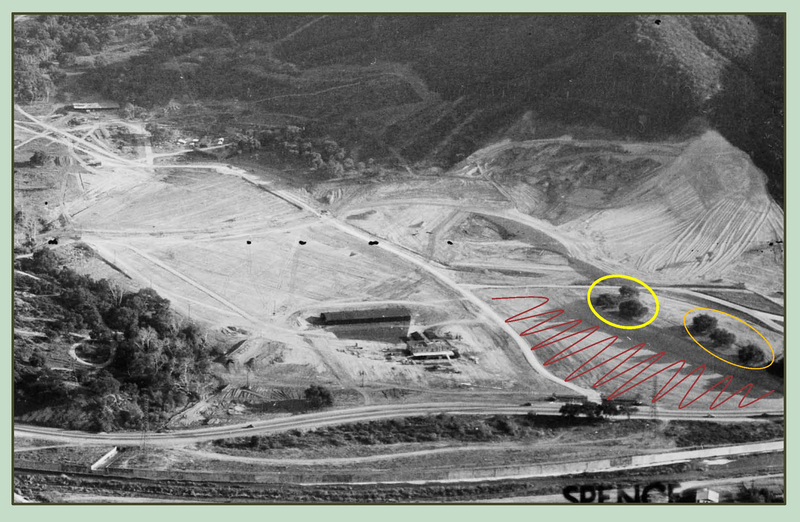 Next, the image below shows how the Lasky Ranch was heavily graded while being converted into a cemetery, removing or changing many landmarks. Hills H1 and H2 were lowered (to accommodate more burial plots), and the battlefield was scraped flat. Looking south. The battle field area from The Birth of A Nation was heavily graded (wavy lines) to provide for more burial plots. Marc Wanamaker – Bison Archives. Trees F2 and S from the BOAN tree group were lost during the Forest Lawn conversion. Hundreds of pine trees, now 60 years old, were later planted among the sturdy native oaks to complete the landscaping. Detail from above. Due to the grading of the battlefield site, trees F2 and S of the BOAN group (yellow) were removed. The trio (orange) was left alone. 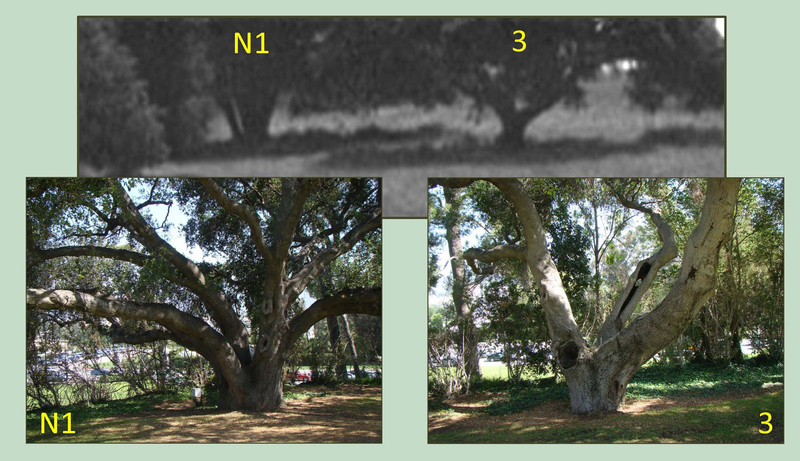 Click to enlarge – trees N1 and 3. There remain today at Forest Lawn several massive oak trees, standing among smaller second and third generation oaks, and dozens of pine trees, now 60 years old, that were planted in the 1950s as part of the cemetery landscaping. These massive oak trees must include those that appear during The Birth of A Nation, and Playing The Ponies – but how can we be sure which is which? 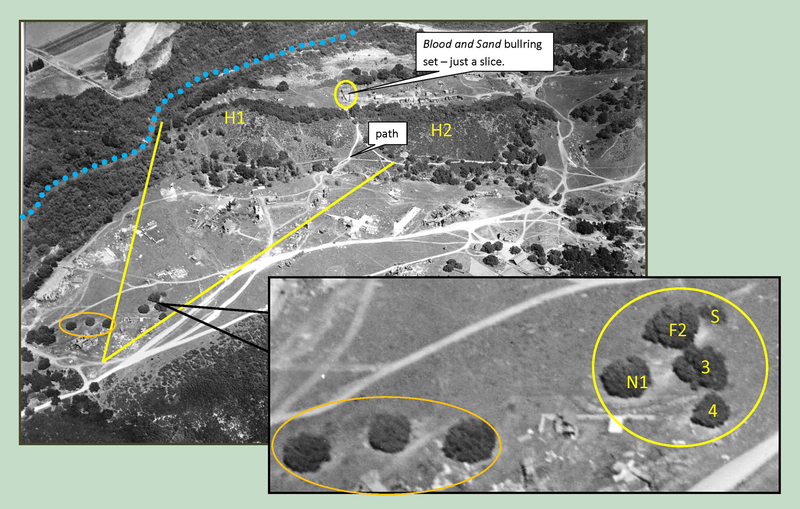 By using logic, aerial views from Google Maps, and studying the candidate trees in person, I am convinced that trees N1 and 3, appearing in both films, are the two trees identified at left. How can we know the answer? By accounting for each tree. (C) Google. 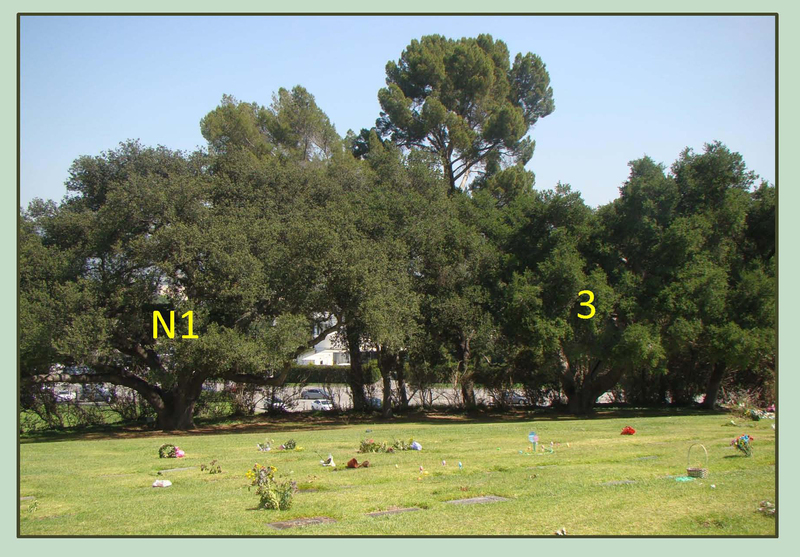 By visiting Forest Lawn in person, it quickly became evident which tree is which. First, many trees in the above aerial view are pine trees, planted 60 years ago, and thus were not present during the filming. Next, there are a few scattered, small oak trees that represent second or third generation young growth. 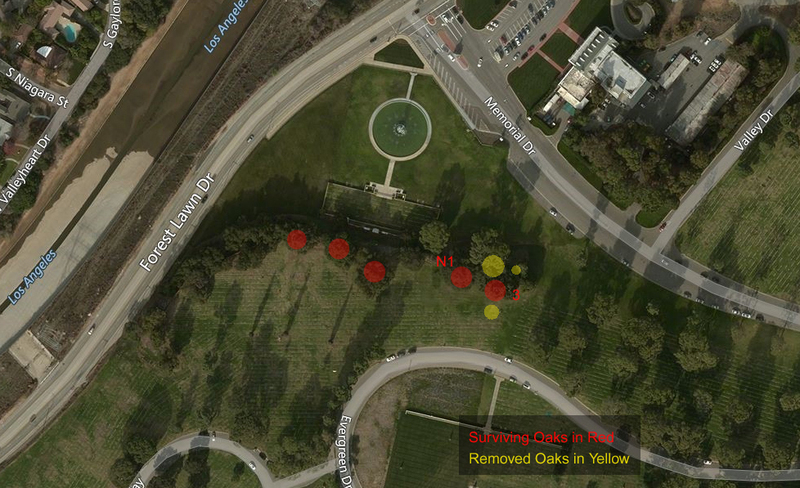 Then there are three massive oak trees that line up in position with the original trio of trees (orange oval). Likewise, we know trees F2 and S of the BOAN group were lost during the conversion. 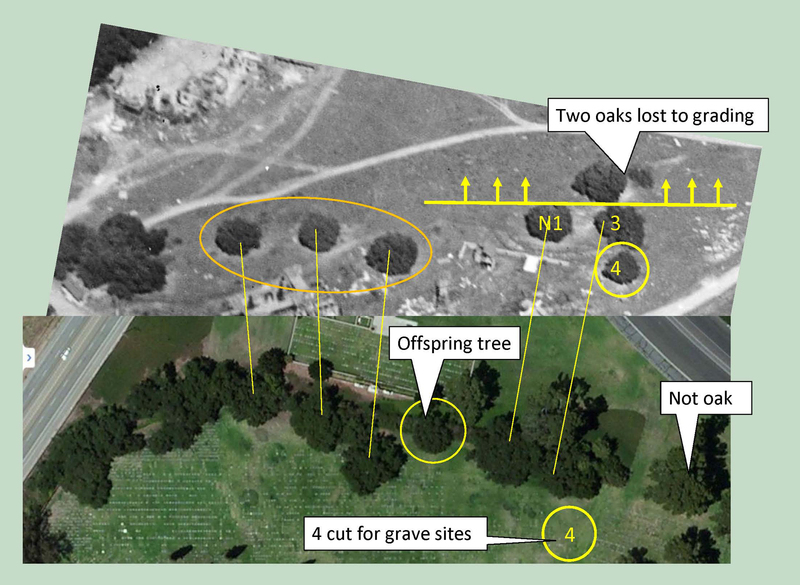 If we assume that the smaller tree 4, which stood away from the BOAN group, was sacrificed to make way for more burial plots, then the two massive trees standing south of the trio must be the surviving trees N1 and 3. Since there are no other massive oak tree candidates from which to choose, these two trees must be the ones to appear in The Birth of A Nation. This reverse detail from Playing The Ponies shows that tree N1 has many trunks, and tree 3 is more “Y” shaped. As further collaboration, the black and white image above comes from that detailed west-looking image appearing in Playing the Ponies. While the original view looks west, to aid with comparison I flipped the image to approximate how it would appear when looking east. With this visual approximation, we would expect tree N1 to have many dense trunks, and would expect tree 3 to be somewhat “Y” shaped. When viewed in person, trees N1 and 3 are both consistent with this expectation. My friend “Skip” plotted the tree positions from the vintage photo as circles in Photoshop over a modern view. Then and Now – 100 years apart. Trees N1 and 3 were already massive and old during the production of The Birth of A Nation one hundred years ago. Today they stand as silent witnesses to a century of movie history. Playing The Ponies Copyright 1937 Columbia Pictures Corporation of Cal. Ltd.
View of the BOAN trees at Forest Lawn. 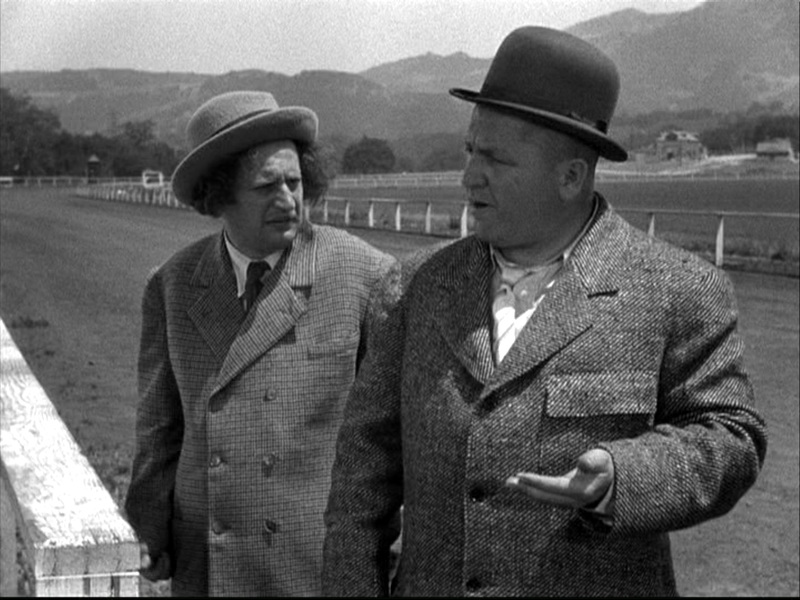 This entry was posted in Three Stooges and tagged Blood and Sand, Curly, D. W. Griffith, Forest Lawn, Harold Lloyd, Larry, Lasky Ranch, Moe, Playing the Ponies, Providencia, Rudolph Valentino, Silent Movie Locations, Silent Movies, The Birth of A Nation, The Three Stooges, then and now, Three Stooges. Bookmark the permalink. Great work and incredible to see the bullring set from Blood and Sand! A nice change of pace, focusing in on trees instead of the usual buildings. A fun read! Tree-mendous work as usual John! Thank-you!!! Just love this stuff Mr. Bengtson, so very very interesting. Thank you for sharing it. Ok it’s official. You are either out of your damn mind or a secret genius. I’m gonna go with total genius! Wow, you identified individual trees in 100 year old movies, and then found them in a current cemetery . You are amazing, I love it! Fantastic and I thank you very much for this wonderful pathway to the past/present. I did the Image Entertainment restoration of BOAN and am talking about it next Wed at the Autry Museum on the subject of Civil War movies for Rob Word’s “A Word on Westerns” talk/Youtube video. Your analysis was very helpful in visualizing the location in perspective of when it was made, its mark on film and the luck to be talking about it not far from where it was filmed. Dad and Uncle Donald lived in Glendale in the 20’s. They used to sneak onto a filming site to play on the sets. Somewhere I have photos of them in wigs they’d found on one set, playing swashbucklers in a castle set. My guess is that the sets were on the Lasky Ranch? Ps. Many thanks for this. it’s most helpful in the book I’m writing. Thank you again for pin-pointing where scenes from ‘The Birth of a Nation’ were shot. I have been speculating about where the battle scenes were shot for many years and thanks to you I now know where. Fantastic site you have here but I was curious if you knew of any message boards that cover the same topics discussed here? I’d really love to be a part of online community where I can get comments from other experienced people that share the same interest. If you have any recommendations, please let me know. Many thanks! A good group on Yahoo.com is “StudioBacklots” (of which I am a member). Also, on Facebook, you could “like” / “join” the page The Hal Roach Studios as there are many of us location fans there too. Thanks again for this wonderful scholarly work. A question – there’s apparently a rural town in the background of the battle scenes. From other landmarks, that appears to be to the SE. Any idea what the town might be? Tropico? Glendale? Atwater? Many thanks. John, I forgot to specify that that’s the Battle of Petersburg from BOAN. The scene is the one in which the Union artillery comes into the scene. From your photos, this particular shot looks as if the camera were pointed toward the SE. That’s where the small rural collection of buildings is located. From Google Maps, it looks like a straight line drawn from the camera position would be indicating Atwater (Village) or perhaps Glendale. If I figure out how to attach a still, I’ll do so. In the longer version, Kino I think, the view which starts with the title “The Field Artillery” at 55:20 or so, shows the direction but not the town. ACTOR GILBERT ROLAND TOLD ME HE FILMED SCENES AS RUDOPH VALENTINO’S DOUBLE WITH THE BULLRING SCENES AT LASKY RANCH WHERE HE SAID HE RODE DOWN CAHUENGA BLVD TO THE LOCATION. I ALWAYS ASSUMED IT WAS UNIVERSAL. GREAT FILM RESEARCH AND LOCATION DETECTIVE ID ON YOUR PART. Hi Luis – thank you so much for sharing this. Although it seems so remote, the Lasky Ranch was geographically closer to Hollywood than was downtown. Hi John, thanks for your response – on your C-K-L film locations webpage. As I mentioned there, I like seeing locations in their past glory; as such, I am enjoying your webpages/work. I often cross reference old photos, and/or maps with google maps/Earth for fun. I am just getting into old films, and attaining some familiarity with the L.A. area. I had heard of Lasky Ranch, but didn’t know anything about it. I was surprised and excited to learn that Forest Lawn Hollywood Hills was previously a very popular filming location. Now it gets personal, my dad grew up in the Van Nuys area, but moved away in his late teens – ending up in NorCal. His father died when he was 12 and is buried in FLHH. After thoroughly reviewing the info that you presented, and looking up his grave site information, I found that he is buried only a couple of hundred yards away – down Memorial Dr to the E SE of tree 3 of the BOAN group. My father passed away recently at a fairly young age too, and I really wish he was here to share this with as he would have enjoyed it, and had much to share too. The next time I am in the L.A. area I am definitely going to visit the place, and thanks to your work, the experience will have a much more interesting context. Anyways, thanks for your work, and I look forward to my copies of your books arriving soon.